These 50 high page authority 28+ Tumblr backlinks will do the job. This is amazing value for money. You can rank no. 1 for just $20. I will develop 50 unique articles for you that are niche relevant. These articles will index in Google search and push your site to the top. I will post each article to 50 different Tumblr blogs, you will get 50 backlinks from 50 different Tumblr sub domain URLs. Most of the Tumblr blogs have a page authority of 31 and above, absolutely all of them are indexed in Google search. You can provide 50 anchor text if you want to. You can also ask me for what I think is best to push your site to the top. Just the 50 unique articles is worth the money alone. You are certainly getting a bang for your buck here. ALSO: You can split the backlinks up to 5 URLS. If you want to split to more than 5 URLs please message me first before you order. 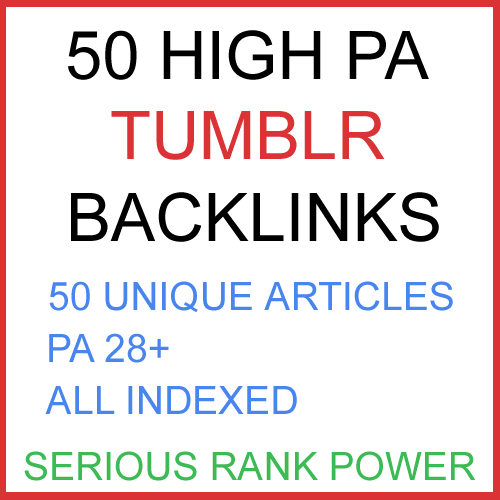 50 High PA 28+ Tumblr Backlinks Unique Content is ranked 5 out of 5. Based on 61 user reviews.